This is an extremely effective and neat way to nymph! Otherwise known as shortline nymphing, heavy nymphs and long rods are a bonus in most cases. Below the waters surface is a world like no other. 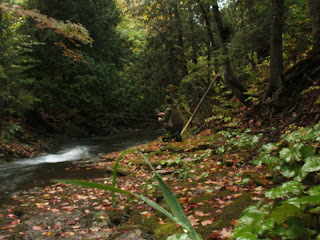 Minnows, leeches and other creatures lurk about, hoping they are not being watched by a big trout. What we are concerned with here however is not a minnow or a leech, but larvae, pupae and nymphs. Streams abound with these pre-flight creatures year round, so its not all that surprising that the diet of a trout consists of some 70-80% nymphs taken below the surface. With different species, different water conditions and water quality, it can seem quite daunting at first to look below the surface for some great action….year round to boot! I’ll start with a method that is referred to as ‘High-stick nymphing’. Just like the name sounds, the method employs the technique of keeping your rod tip high in the air while drifting your nymph through likely lies. The method requires that you keep as little of your fly line on the waters surface as possible, and preferably none at all will touch the waters surface. The length of your leader should reflect the depth of the area you are fishing. 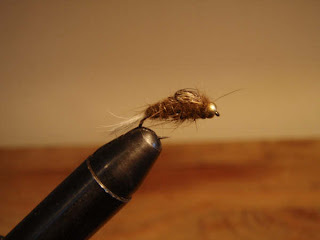 I prefer to use weighted nymphs before using weight added to the line. I find that adding a couple of shots to your line will take away from the subtle takes usually observed with this type of fishing. Once you’ve found the section of river you are going to tackle, position yourself downstream of the drift your are attempting. Strip out just enough line to cover the water you are drifting, and gently flip your nymph upstream. As the fly lands and sinks, gently lift your rod tip to remove any slack between yourself and the fly, taking care to keep your fly line out of and off of the water. 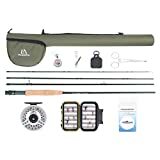 Now, move your rod tip downstream at the same speed that your nymph and the current are travelling. As the nymph drifts downstream, it will bounce along the rocks and other debris that sit below the water surface. If you see a slight pause or anything abnormal happening with the line, give a gentle snap with your rod to set the hook. Eventually, with enough practice, you’ll know just when its a trout mouthing your offering, or your nymph hanging up on the bottom of the river. The bead head nymph is a pattern that consistently takes fish year round.